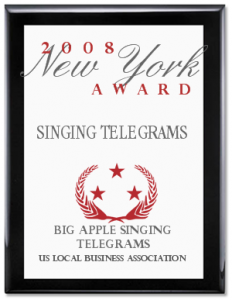 Originally “Singing Telegram Anytime”, located in Manhattan for 25 years, now Big Apple Singing Telegrams. We entertain an established clientele list. Last year seen on WNBC 4 New York with Al Roker, FOX News morning show, New York 1 George Whipple. Est. 1979, Manhattan. 24 years of “Guranteed Laughter” Goriallas, French Maids, Elvis, Marilyn and Sinatra, we have them all!